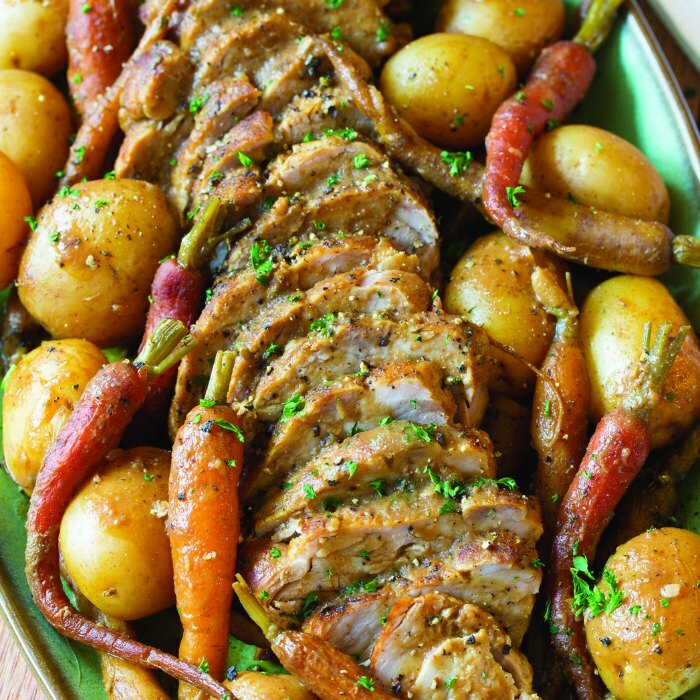 Get an amazing dinner on the table easily with a Slow cooker Pork Loin! This one-pot dinner not only saves time on busy fall evenings, it also boasts a rich, tangy sauce that gets a special twist from the spice of apple butter. Crisp mornings, cozy sweaters and a craving for comfort foods are all sure signs that autumn is in the air. No fall menu is complete without hearty, homestyle dishes that evoke feelings of well-being and warmth, and there’s no better way to capture the flavors of fall than with the season’s signature ingredient – apples. Serving up fall’s best feel-good foods doesn’t have to be hard. One clever solution: apple butter. Made from apples slow-simmered in kettles of sugar, apple cider and spices, apple butter is more than just a spread. It’s also a versatile ingredient that can enhance your favorite sweet and savory recipes. I prefer to use Musselman’s Apple Butter, which lends a unique taste to main dishes and desserts alike. Find more feel-good recipes for fall at musselmans.com. Place large nonstick skillet over medium-high heat. (If using regular skillet, add 1 tablespoon oil.) Season pork loin with salt and pepper, and place in skillet. Sear pork loin on all sides to seal in juices, about 8-10 minutes. Peel onion and cut into large chunks. Cover bottom of large, 6-quart slow cooker with half the chopped onion, potatoes and carrots. 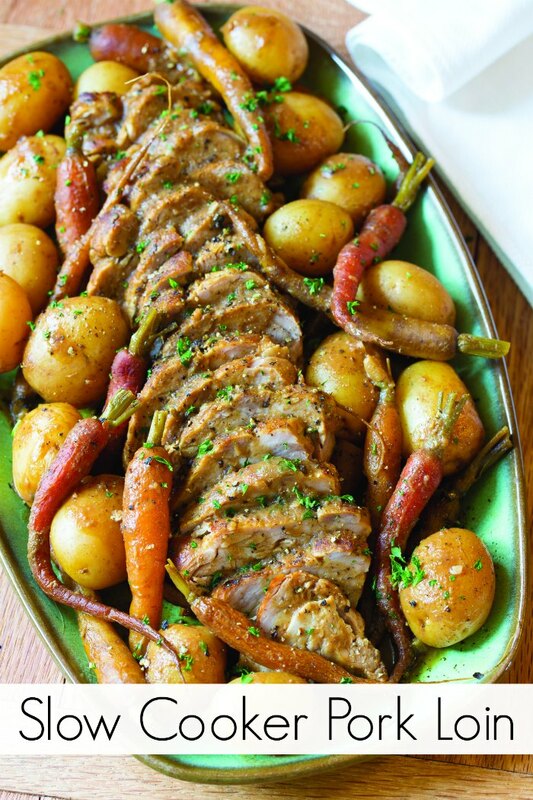 Lay seared pork loin over top and surround with remaining vegetables. In small bowl, whisk together minced garlic, apple butter, mustard, soy sauce and broth. Pour mixture over pork and vegetables. Cover slow cooker and cook on low 8-10 hours or high 4-6 hours. Once potatoes are tender, cut tenderloin into thin slices and place on platter, surrounded by vegetables. Taste gravy, and season with salt and pepper, as needed, then pour gravy over pork and serve. This one-pot dinner saves time on busy fall evenings, it also boasts a rich, tangy sauce that gets a special twist from the spice of apple butter. Oh Jennifer – that looks succulent and beautiful! Thanks for sharing on the What’s for Dinner Link up! Oh gosh does that ever look good! I love the idea of the apple butter; it’s so rich and thick and I bet it tasted wonderful in this – plus once I open a jar I’m really excited and use it several times, then maybe the next week once or twice, and then it tends to languish in the fridge. This would be a great way to ensure it doesn’t sit too long after I lose interest! It’s going on my must make list! Happy Thanksgiving and thanks for sharing with us at Throwback Thursday! I love slow cooking and this pork looks so delicious. Thanks for linking up and sharing at #overthemoon I’ll be trying this recipe for sure. This is a beautiful Slow Cooker Pork Loin, and so easy in the slow cooker. I really appreciate you sharing with us at Full Plate Thursday and hope you are having a safe and enjoyable weekend. Wow, that picture is making me so hungry. The pork looks so juicy and tender! Pinned. What a great comfort food recipe for fall and winter. I can’t wait to try it. I hope are all are enjoying this preparation of yours at the party.. Thanks for joining us and happy Fiesta Friday ?!! Your Post is featured on Full Plate Thursday this week. Thanks so much for sharing with us and enjoy your new Red Plate. I made this last night for supper…super delicious! Will definitely be making this again and often!